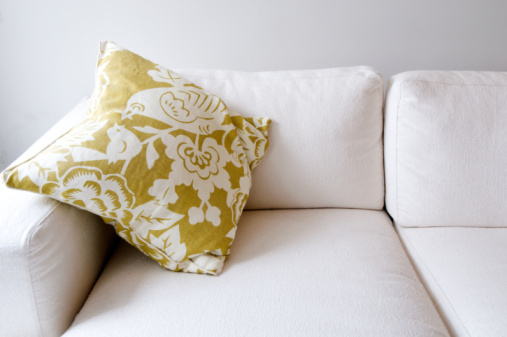 Like any other household item, your sofa becomes coated with dust and dirt over time. Regular shampooing is a must to maintain an attractive appearance, especially for sofas with light-colored upholstery. You can use a carpet cleaning machine with upholstery attachments or an aerosol upholstery cleaner. Carpet cleaning machines are very efficient, but must be used carefully to avoid leaving too much moisture behind. Always test an inconspicuous area of the fabric to ensure the cleaner doesn't cause shrinkage, bleeding or fading. Shampoo sofas with a carpet cleaning machine or an aerosol upholstery cleaner. Vacuum all parts of the sofa, including beneath the cushions, with an upholstery attachment. Fill the carpet cleaning machine with the appropriate amounts of water and detergent. Apply the cleaning solution sparingly to the sofa and cushions. Use the upholstery brush to gently scrub the fabric. Pull the attachment backward without squeezing the trigger to remove the moisture as you go. Allow the sofa to dry completely before putting the cushions back in place. Vacuum the sofa and cushions thoroughly. Hold the can of carpet cleaner upside down and spray onto the sofa and cushions. Allow the cleaner to remain in place for the recommended amount of time. Remove the cleaner from the sofa with a dampened sponge. Use a blotting motion to avoid rubbing loosened dirt back into the fabric. If it still feels very damp, blot with a dry cloth to remove excess moisture. Replace the cushions after all parts of the sofa are dry.